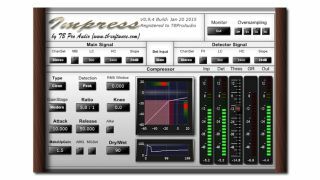 Impress is a new stereo compressor that's designed "to cover a broad range of compression applications in today's mixing and mastering situations with a strong focus on low aliasing." There's a multiband filter for the main signal, a prefilter for the detector signal and flexible monitoring. The interface is designed to give you detailed visual feedback on how your signal is being processed. Find out more below or on the TBProAudio website, where a demo can be downloaded and Impress can be purchased in 32/64-bit VST/AU and 32-bit RTAS formats for €59.